The delightful city of Bellevue, Washington, is found nestled in the Eastside region of beautiful King County. Home to around 122,400 residents, Bellevue sits across the glistening waters of Lake Washington from the City of Seattle. Bellevue is often referred to as a satellite city, edge city or boomburb, as it is Seattle’s largest suburb. Downtown Bellevue alone has more than 10,200 residents, employs 45,000 people, is home to 1,300 businesses and is the 2nd largest city center in the state. In addition to boasting a remarkable downtown, Bellevue also has a multitude of prestigious accolades and recognitions. There are 522 communities in the state of Washington and Bellevue is ranked as the 6th wealthiest based upon per capita income. 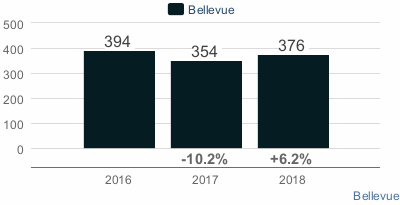 Bellevue was ranked the 4th best place to live in the nation in 2010 by CNN Money. CNN Money also ranked Bellevue 1st on their 2008 lists of the best places to launch a business and best places to live. 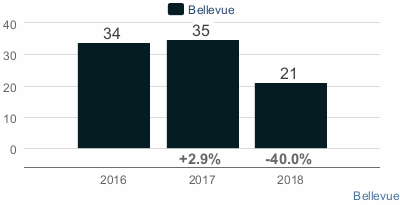 In more recent years Bellevue has shown no signs of slowing down and in 2014 was ranked No. 2 on USA Today’s list of the best places to live. Meaning “beautiful view” in French, Bellevue has a rich history dating back to 1869 when it was founded. Though the city has been around for a long time, Bellevue wasn't incorporated until 1953. 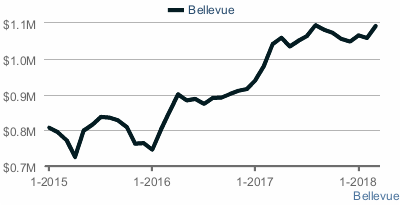 Bellevue’s growth is the result of first one, then another bridge crossing into Seattle. Bellevue is nestled between Lake Washington to the west and Lake Sammamish to the east. With 36.47 square miles, 4.5 of which are water, Bellevue is a city with abundant natural beauty. Bellevue is also home to a multitude of remarkable real estate opportunities within its many elegant neighborhoods and subdivisions. Among the most noteworthy Bellevue neighborhoods you’ll find downtown Bellevue, Wilburton, Lake Hills, Lakemont, Eastgate and Robinswood. Other Bellevue communities include Bridle Trail, Enatai, Woodridge, Sammamish, Newport and Sunset, among many others. Homes for sale in Bellevue vary in price depending upon the property’s age, size and architectural style. The most affordable housing options include condos and townhomes. 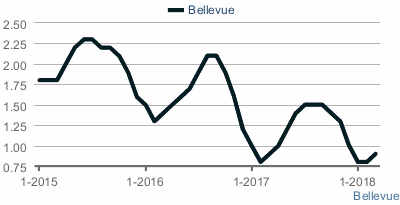 Condos and townhomes in Bellevue have listing prices that start around $125,000. At the other end of the spectrum, single family homes top out the real estate market with listing prices as high as $16.5 million. 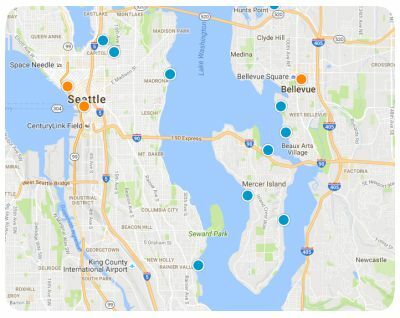 Of course not all Bellevue single family homes for sale have listing prices in the millions, there are many affordable homes for sale as well. If you would like to learn more about the homes for sale in Bellevue, Washington, please do not hesitate to contact us today for more information.